Sustainability is a lot more than just growing organically. Sustainability is putting into practice methods of gardening and maintaining your landscape that allow you to simultaneously grow your own food and healthy plants while respecting and nourishing the soil, insects, microorganisms and wildlife that naturally help to keep your gardens and plants healthy, and cause as little disturbance as possible to those same things. Like many of you, I am an ordinary backyard gardener trying to keep up with a full time job, a family and friends, as well as maintain my home and property. I don’t have a lot of time or money for time consuming and expensive gardening practices. So how can we possibly engage in sustainable gardening? Be realistic and do whatever you can, giving as much attention as possible to eliminating the use of pesticides in particular. But there really is so very much you can do that may not only save you time, but also save you money and help you grow better plants too! Buy a rain barrel, or two, or more. Rain water is free to collect and use, and is much better than city tap water for your plants. Rain water contains some natural nutrients and has no added chemicals. A rain barrel does not have to be expensive, some cities or counties even sell simple rain barrels at very reasonable prices. Mine is an open collection barrel with a screened top, so it does not have to connected to a downspout. It collects roof runoff for quick filling but could sit right out in the garden. In inexpensive barrel will pay for itself by saving on your water bill. A thick layer of mulch will not only save you weeding time, but will help your soil to retain moisture so you can reduce supplemental watering. The savings in time and water are well worth the cost of the mulch. I bought a reasonably priced leaf blower/shredder several years ago that probably paid for itself in one season. I blow all my fall leaves into piles, shred them, and add to the compost heap, pile up around evergreens, perennials and roses for mulch and winter protection, or dig right into the vegetable garden in fall for nutrients and to improves soil texture. I have saved a ton on yard waste bags, waste hauling charges and purchased mulch. It does take a little time shred all my leaves, but not much more than raking and bagging. And in the last sunny days of autumn I don’t mind spending the afternoon outside. This is such a very simple thing for everyone to do. You not only make excellent use of “garbage”, but you will reduce the need for purchased soil additives and fertilizer, and your plants will absolutely love it. You will not have to pay to have fall leaves and yard waste hauled, and you will not have to purchase expensive yard waste bags. You may even be able to reduce your garbage collection when you use all your kitchen scraps. I know it seems complicated for a new gardener but it does not have to be. I keep a coffee can with a lid in the kitchen to collect food scraps, peelings, egg shells, coffee grounds, paper napkins and spoiled fruits and vegetables. This is convenient to carry out to the compost pile every couple of days and dump it right in. You will also need plenty of dry materials such as dried grass clippings, shredded leaves or shredded paper (see the composting article to learn the basics). Your compost can be a heap behind the garden, or you can build a bin, or purchase in inexpensive compost barrel from your city or county, or go all in with a fancy turning barrel. My compost “center” started with a heap, expanded with a city barrel, and eventually I added a great turning barrel from Sam’s Club. Don’t hand water or use a sprinkler for your gardens if you can avoid it, unless of course you are using your rain barrel water. Every spring I snake soaker hoses through my gardens and leave them lay there all summer. When the garden needs water I just snap the garden hose on with a quick connector. 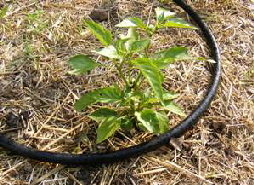 The soker hoses slowly soak the garden soil exactly where it is needed, deep in the soil. Your lawn well be greener and healthier if you use a mulching mower and raise the blade, leaving it a bit longer in the hot summer months. Less sprinkling and fertilizer will be necessary. With that said, I DO keep the grass healthy to make sure it does not need a lot of watering. I fertilize lightly three times a year, but try to use a low nitrogen fertlizer, organic if I can afford it. Ordinary organic granular garden fertilizer works great on the lawn. And when you do have to water in dry periods, make sure to soak the lawn deeply. Water that has soaked deep in the soil will remain there longer and available for grass roots. Shallow watering dries up out of the surface soil very quickly. A lot of plastics you use related to garden and lawn care can be recycled. Plastic plant pots are accepted now by Lowes for recycling, and some trash haulers will take them if the soil is washed out. I save all plastic bags from mulch, manure and potting soil and re-use them to dispose of other household waste rather than purchasing plastic garbage bags. Rather than purchase expensive landscape fabric for a weed barrier under mulch, use thick layers of newspaper, paper grocery bags, or cardboard instead. Over time it will decompose and add nutrients to your soil. Select perennials that are drought tolerant to reduce time and money spent on watering. Native plants are often an excellent choice and typically require little as far as maintenance and fertilizing. Use plants that are naturally resistant to disease and pests to reduce the potential need for treatment. when you do need to treat plants, try to use natural and organic means if possible. and learn to live with a little insect damage and powdery mildew to eliminate treatment. Before selecting plants, so a soil test. Knowing the pH of your soil and any unusually high or low minerals or nutrient levels will allow you to select compatible plants rather than spend time and money amending your soil. Plants native to your area are generally ideally suited to local soil conditions. A lawn that is over watered tends to grow weak and soft rather than healthy. And plants that are over fertilized grow quickly but with weak stems and foliage. For a healthy lawn and plants, feed and water only as much as they need to be strong. Position shade trees where they will block hot afternoon sun from your home to save on air conditioning. In the winter after the leaves drop, your home will be exposed to warm sunshine to reduce heating needs. Position wind blocking evergreens where they will prevent cold north winds from buffeting your home and save on heating bills. Get some exercise without paying the gym and pull up weeds rather than use chemical weed killers. And sweep your garage, patio, walks and driveway rather than wasting water by hosing them off. You may not be able to do everything on this list, but everything that you CAN do will help to sustain a healthier natural ecosystem. And you just might save some time and money along the way.